Macular drusen are one of the first symptoms of age related macular degeneration (AMD). Drusen are small, yellow deposits in the macula that are often found in those 60 and older. These small deposits can be seen by your eye care professional during a dilated eye exam. This is what they look like. When there is an increase in the size or number of drusen a person's risk of developing either advanced dry AMD or wet AMD increases. 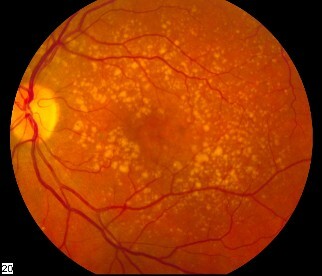 There are three stages of age related macular degeneration. √ May see a blurred spot in the center of their vision. There are two types of macular drusen - hard and soft. The hard form is the less harmful one and very commonly seen in aging eyes. The soft form is larger and characterized by ill-defined borders. The soft form is more often associated with loss of vision.
" eyes with large drusen go on to develop severe AMD with vision loss much more often than eyes with small drusen. The size of the drusen is a more important prognostic sign than the number of drusen." If your eye doctor has just discovered macular drusen in your yearly eye exam, you may want to find out what you can do to make any changes in your diet and lifestyle to help take better care of your eyes. "Early, dry AMD can be prevented, slowed, and even reversed with diet and lifestyle changes. In its early stages, progression to blindness can be prevented with appropriate nutritional interventions."